(NaturalNews) Every year around this time, the vaccine industry, through its vast network of corporate-government health agencies and mass media partners, begins drumming fear into the minds of the public about seasonal flu in order to drive as many people as possible to get vaccinated with a flu shot. And it seems as though every year, more and more evidence also comes to light illustrating precisely why people should not get a flu shot, at least not without carefully considering the serious ramifications of participating in this annual injection ritual. As you likely have already noticed, it is pretty difficult to go out anywhere in public these days and not come across various signs, banners, and billboards plastered with phrases like, "Protect yourself and your loved ones by getting your flu shot" or "Get the shot, not the flu." And yet, no matter how aggressively the vaccine industry tries to push the flu vaccine on the public, it will always remain an unproven, fear-driven, pseudoscientific scam that offers no measurable health benefits. Put another way, flu vaccines are about 98.5 percent ineffective, which means the vast majority of people who get a flu shot are deriving absolutely no health benefit. Again, this is in a best case scenario where potential margins of error are ignored and statistical anomalies are set aside. In all reality, there is actually not a shred of indisputable evidence proving that flu shots are at all effective for preventing the flu in anyone. And yet the U.S. Centers for Disease Control and Prevention (CDC), eager to dispense 135 million doses of flu vaccine this year, is waging psychological warfare on the public by repeating equally false claims about how hundreds of thousands of people end up in the hospital every year as a result of influenza infection, and that about 36,000 of them die from flu-related complications. Besides their ineffectiveness, flu shots also come with an array of potentially-deadly side effects that health authorities rarely disclose to the public. 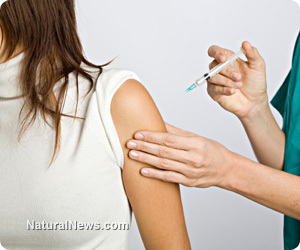 Such side effects include things like brain damage and dementia -- many flu shots still contain toxic mercury, after all (https://www.naturalnews.com/031870_flu_shots_brain_damage.html) -- seizures (https://www.naturalnews.com/029334_flu_vaccines_seizures.html), and even flu-like symptoms, which defeats the point of even getting a flu shot in the first place.